The RM85 continues to carry on the powerful tradition of racing excellence in the Suzuki RM family. The two-stroke engine produces smooth power at any rpm with an emphasis on low to mid-range performance. Just like the larger models, the RM85 delivers class-leading handling for both experienced racers and rookie riders alike. With its smooth power delivery and lightweight handling, the 2016 RM85 is the perfect motocross bike for anyone learning to race—and striving to win! Champions choose Suzuki and Suzuki supports future champions! Suzuki’s Amateur Racing Support is top notch, offering over $3.8 million in contingency, trackside support, and the opportunity to train with Ricky Carmichael at Suzuki’s exclusive Camp Carmichael. Want to see why champions choose Suzuki? Visit racesuzuki.com for more information on Suzuki’s Amateur Support Program and join Team Suzuki! 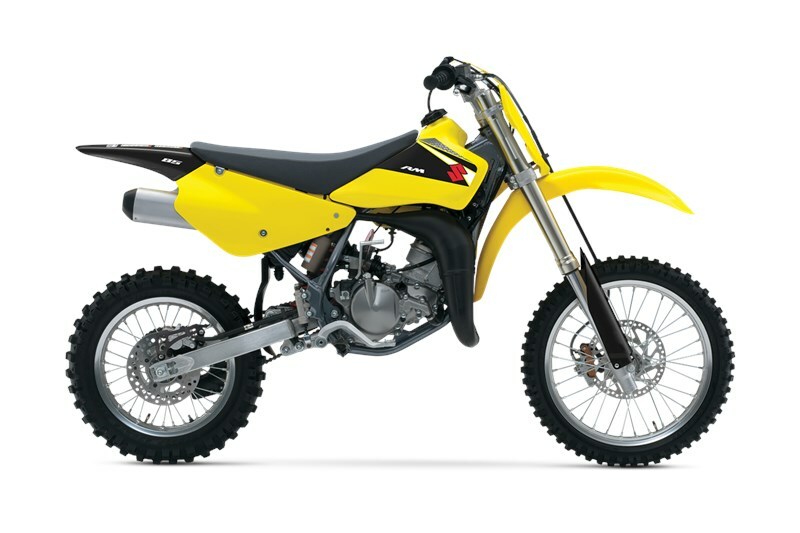 The high-revving 84.7cc, 2-stroke, liquid-cooled, reed-valve, single-cylinder engine has a bore and stroke of 48.0 x 46.8mm. The cylinder features Suzuki Composite Electrochemical Material (SCEM) for durability, low weight and effective heat transfer for superior class performance. Precise Keihin™ PE28 carburetor provides smooth throttle response, and is designed for simplified maintenance and tuning. Digital CDI mapping helps create strong engine performance at high RPM. 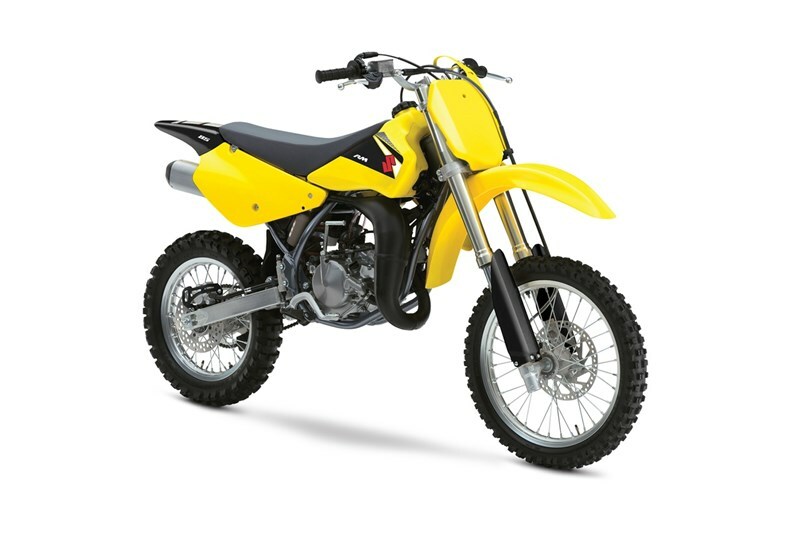 s.
The RM85 is equipped with a smooth shifting six-speed transmission plus a precise rack and pinion activated clutch. The long clutch lever makes it easy to accurately locate and work the engagement point during starts and driving off of corners. A tubular steel frame and thick wall aluminum swingarm provides class-leading performance on the track, especially in the corners. The frame was designed for increased rigidity, durability and straight-line performance; it features large diameter tubing in key areas and a large front reinforcement plate. Showa 37mm inverted front forks are completely adjustable for rider weight, style and ability. The forks feature a cartridge damping system with fully-adjustable rebound damping and 20-way adjustable compression damping (also included are fork guards to protect the inner fork tubes). The front forks offer 275mm (10.8-inches) of travel. A SHOWA large diameter rear shock absorber is valved to produce a plush feel and resistance to bottoming. The shock provides 277mm (10.9-inches) of wheel travel and features adjustable compression and rebound damping force adjustment. A twin-piston caliper front brake with 220mm (8.7-inches) large-diameter disc and a rear brake with 200mm (7.9-inches) disc to provide excellent braking performance. A rigid rear brake caliper provides reliable braking performance, long pad life and is easy to maintain. The caliper’s plastic guard reduces the possibility of damage and saves weight. The forged aluminum-alloy rear brake pedal is light and strong while providing the rider accurate braking feel. Revised graphics with Champion Yellow bodywork plus new black protectors and guards provide a professional race look. Each side of the RM85's seat has textured surface for better knee gripping.